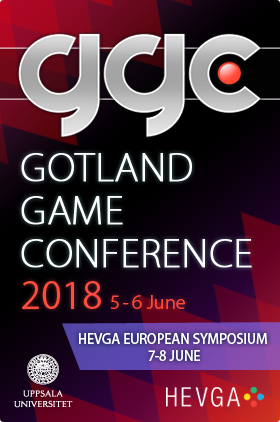 We (ergo: The Department of Game Design) is currently in the middle of planning the 2018 Gotland Game Conference. We have locked in the time and place, and are working hard on firming up the theme, confirming speakers and setting up the ticket-system. Expect these to be announced in the coming weeks and months. Until then you can add the dates to your calendar – 5-6 June 2018, reserve a ferry or plane ticket to Visby, and subscribe to our feed and/or the Facebook page, and we’ll let you know as soon as the tickets are available and the speaker list starts firming up. Notice how his talk was not about his games, not about big brand, big budget productions. Not about consoles or technology or platforms. Instead he spoke with us about the things we really care about at the GGC: games as a cultural expression, as complex bearers of ideas, as a medium of communication. This is what we do! We strive for the Gotland Game Conference to always take a high-minded, human and loving look at games and games culture. Loving, but not uncritical! We engage our medium with honesty, integrity and a willingness to reflect on and do the work and improve the medium. I hope that convinces you to join us at the end of May, to critique and celebrate the games medium, at the Gotland Game Conference 2017!